August is a crazy month for me; its my wedding anniversary, my daughters birthday, and were taking a week long camping trip. 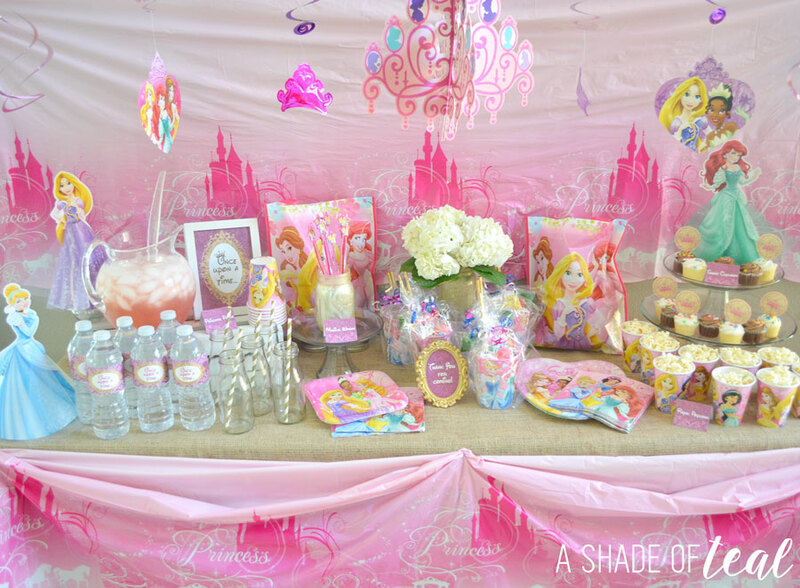 With that said, my daughter will be turning 2 and I thought it would be fun to have a mini party at home with just our immediate family. We still plan on having a larger party with more family and friends a couple of weeks after her actual birthday; which I’ll share more on that later. But, today I’m giving some ideas on how to design a table-scape on a budget plus some free printables! 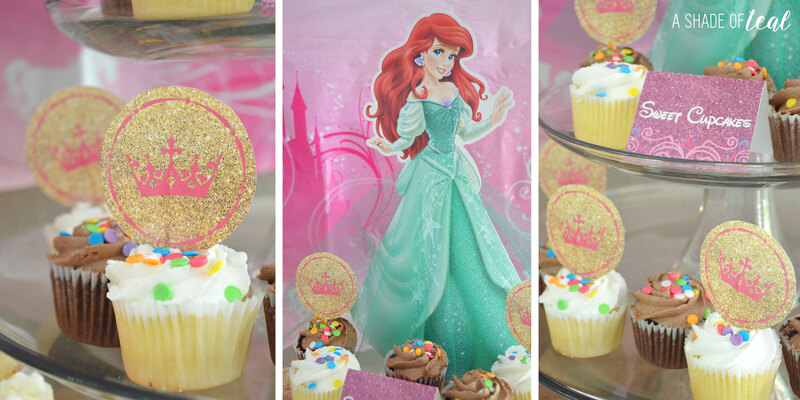 We decided to go with the Disney Princess theme by American Greetings because she LOVES all the princess’ right now. We actually have annual passes to Disneyland since we live pretty close, so shes quite familiar with the characters. 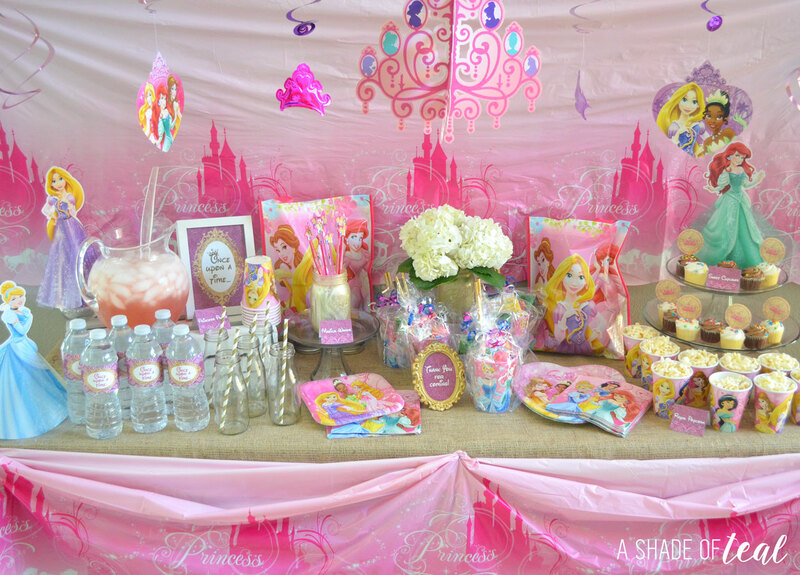 I purchased my party decor from Walmart! 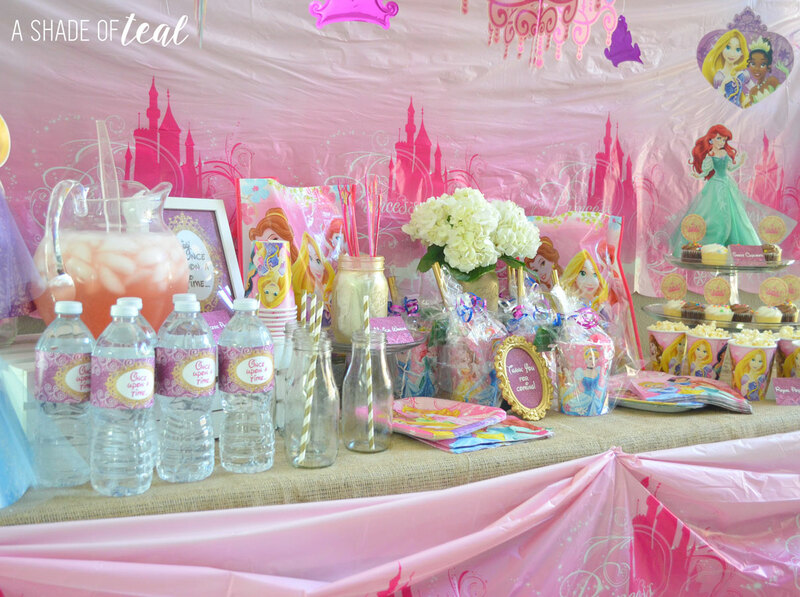 They have a amazing party selection that’s really well organized by theme, and of course the low price’s help! 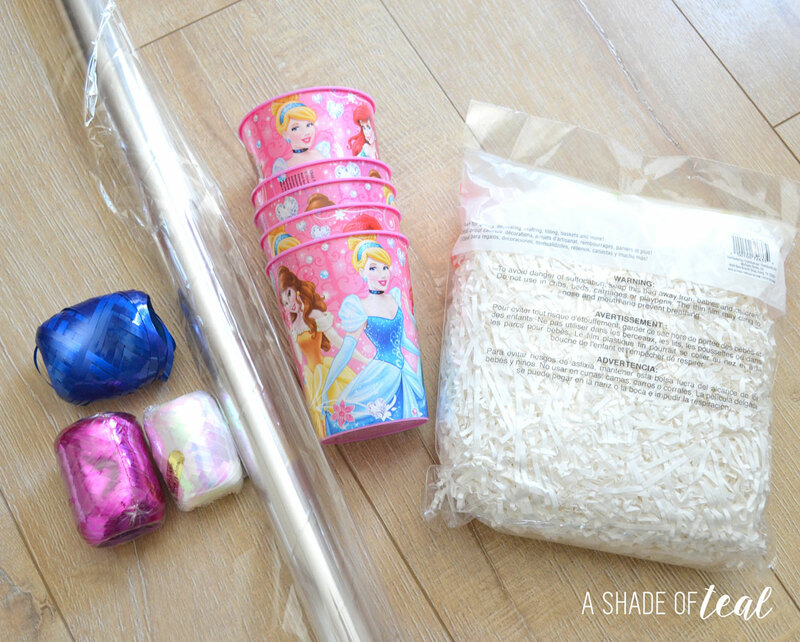 After I bought all the party supplies, which only cost me $25, I got into the party planning mode. I designed a bunch or printables on the computer and then printed them out to use on the table. I love doing this part since its practically free except my time. I made custom invitations, water bottle labels, cupcake picks, and more. See below to print out your own! For the cupcake picks, all you need to do is print out the design. Cut them out, and tape a toothpick to the paper. Sometimes I also like to tape on a back side in-case your table can be seen from the back. 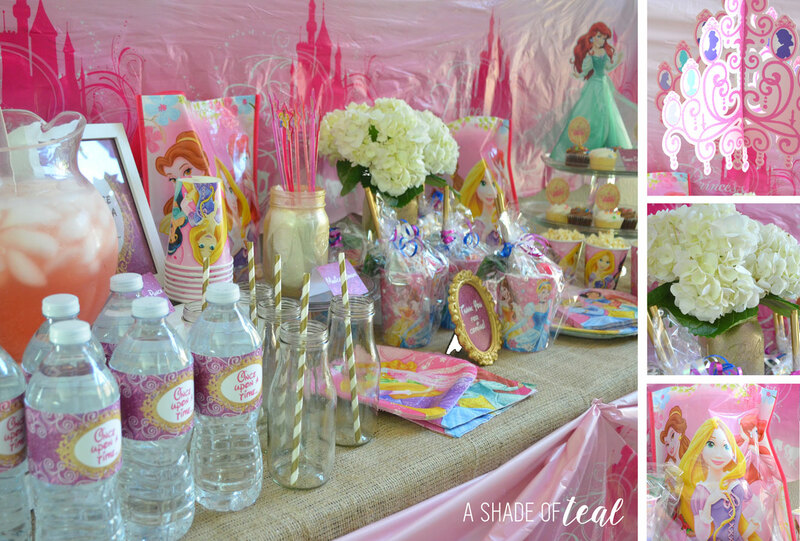 Next, I put together the goodie bags, which I actually used the Princess cups. This turned out so well and was really easy to make. Now for my competed table. When my daughter saw it she was in love, she wouldn’t stop smiling! I think her favorite part was these wands! She wanted them the minute we bought them in the store. I spray painted the mason jars with gold glitter spray paint. I actually took the tablecloth and cut it in half. 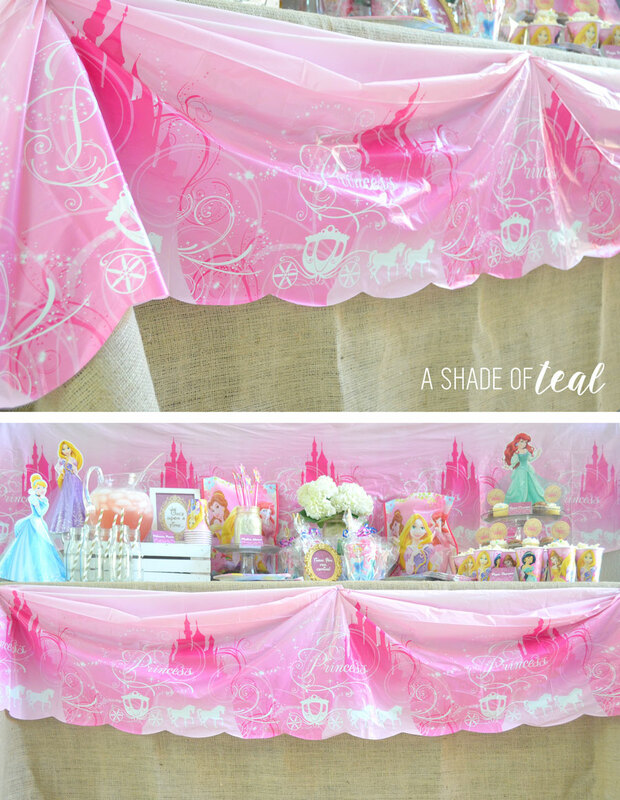 I used 1 half to drape at the front of the table, and the other half I used as a backdrop. I love how it turned out. Here are the custom cupcake picks I made. They were so simple but make a huge impact. 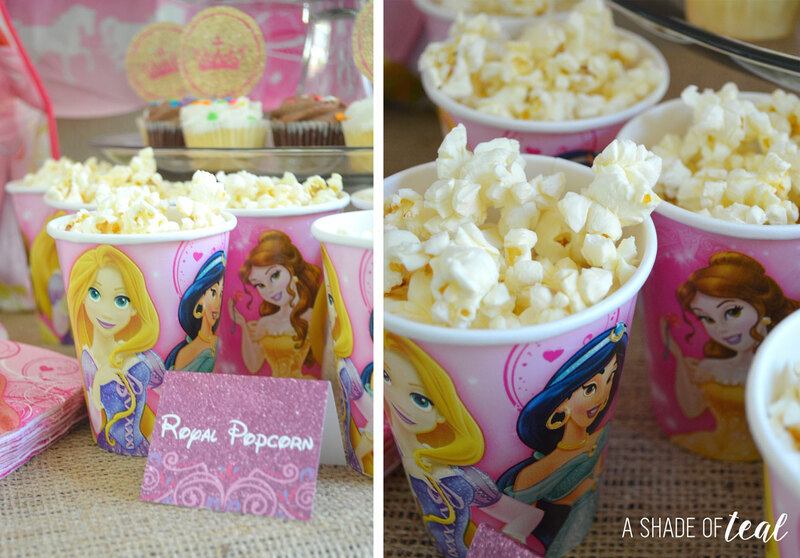 I then used the Disney princess drinking cups as popcorn holders. See below for the custom water bottle labels. Here’s the finished goodie cups. I kept them pretty simple with gold pencils, candy, and a little toy. Well that’s it! 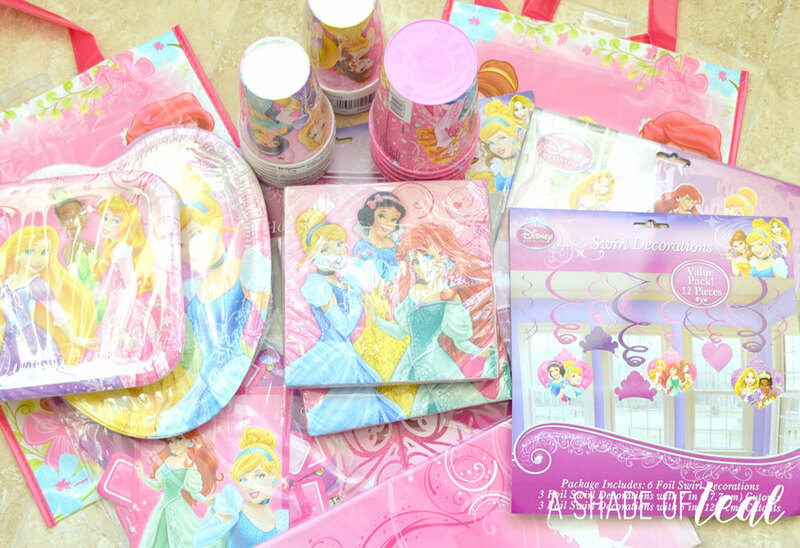 I only spent $25 for Disney Princess Supplies, which some I didn’t even use. Then about $15 for food and drinks and $5 for the hydrangeas. Fortunately the rest were items I had on hand from previous parties. So my total was under $50! Not too bad!!! If you would like the rest of the Printable package visit my ETSY shop Here. 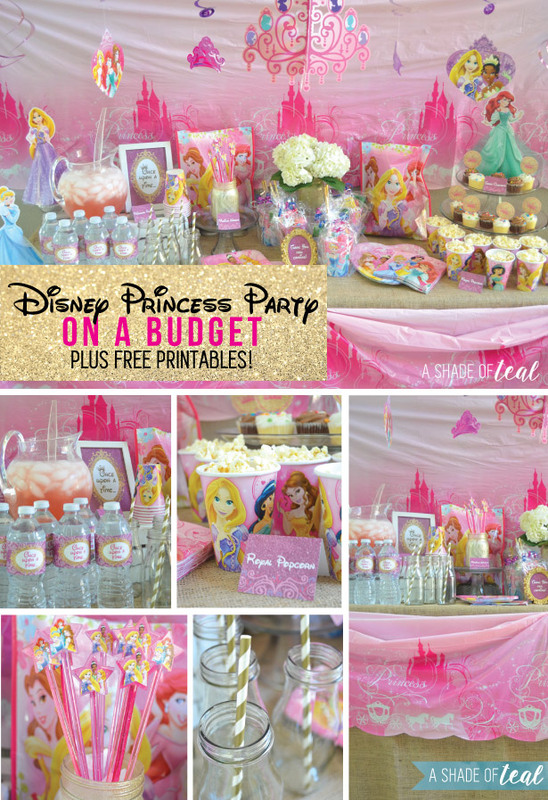 Have you thrown any budget friendly party’s lately? Feel free to share yours tips in the comments, I’m always looking for new ideas! SO cute! I loved the Disney princesses growing up! Love all that you did without spending too much- thanks for sharing! Thanks Ashley! If your daughter is anything like mine she would! 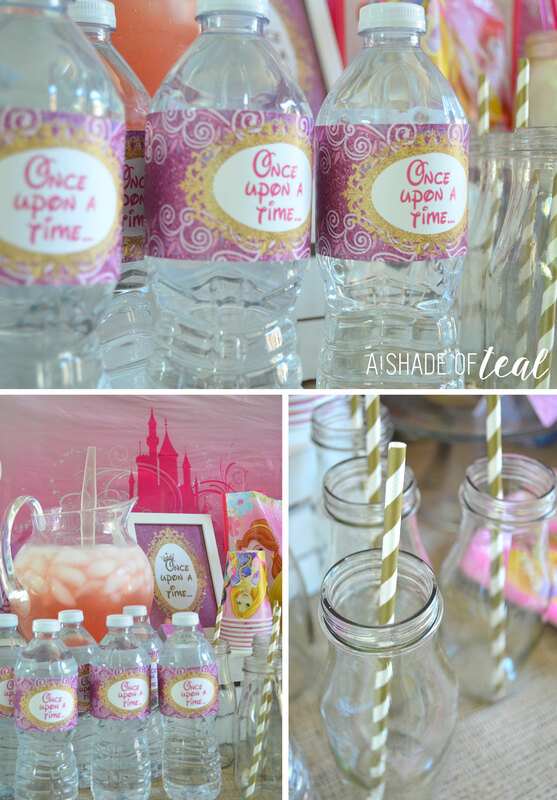 Exactly, my kinda easy/low cost party project! Thanks Diana! Thanks so much Summer! I think the touch of gold on the mason jars was also my favorite detail! 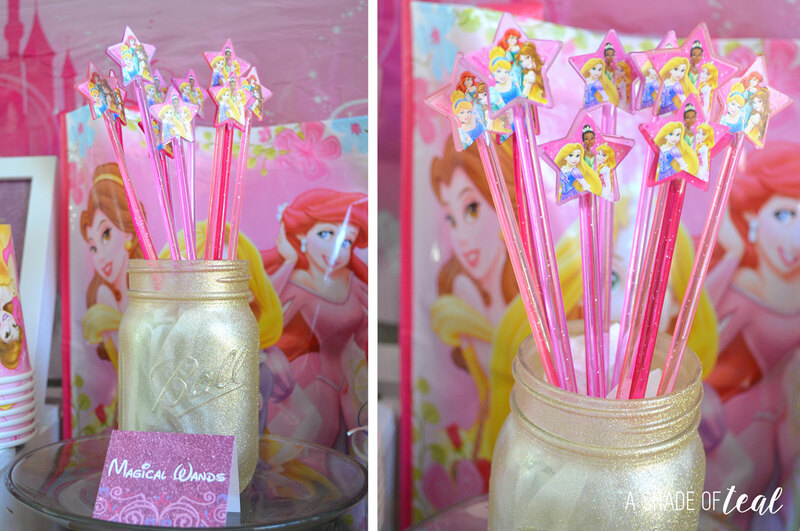 How did you make the precious tent cards for the cupcakes, popcorn, wands, etc…? I am not very crafty but you have truly inspired me to try to be!! 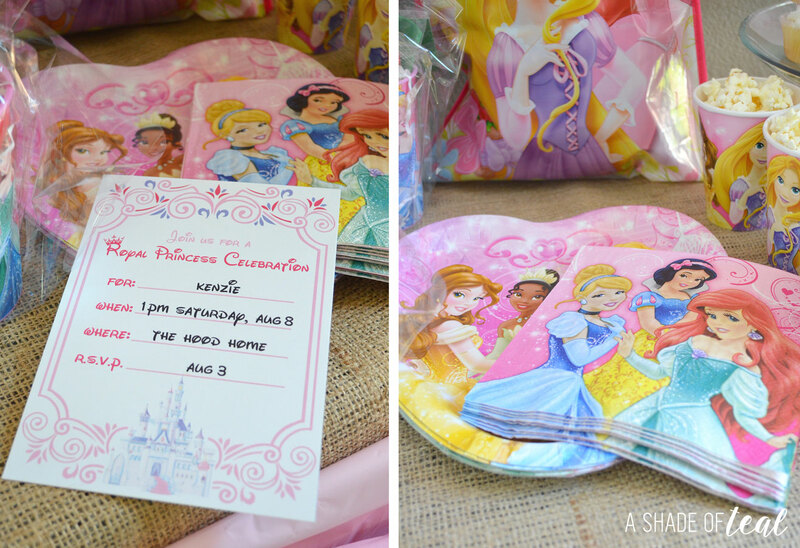 My little girl is having a princess makeover party and I’ve used your other printables. Any direction you can give me would be so appreciated!!! Hi Lindsay! I make all my printables with Adobe Illustrator. Hi Lindsay! I just added the food cards if you still need them. I included some pre-made options or a blank card for you to add your text. Thanks! Do you have a printable for the food cards? I was looking to do Princess Pizza and Princess popcorn. Hi Christine! Yes, I finally just added them. I included some pre-made options or a blank card for you to add your text. Thanks! WOW, that turned out great! Thanks for sharing. 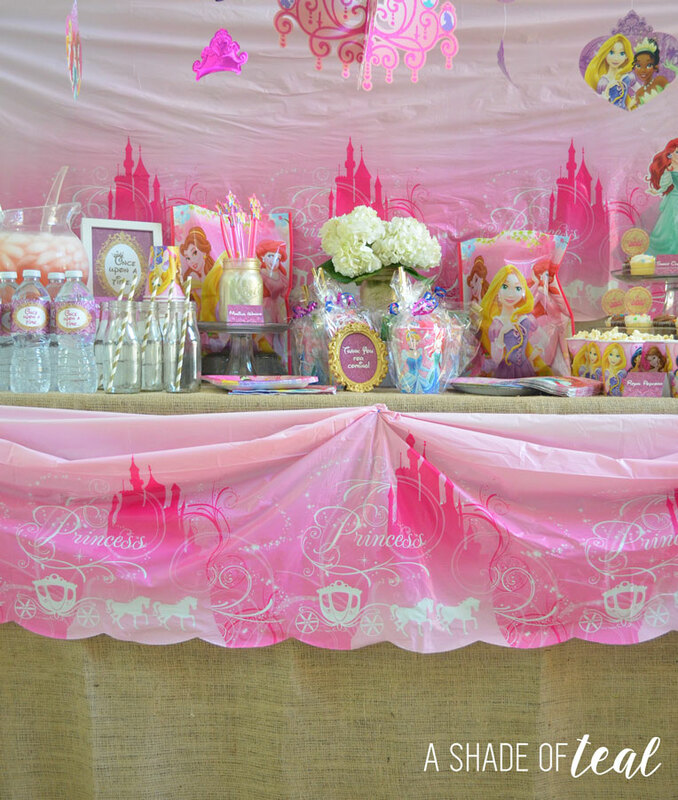 I found it helpful as I am trying to plan my daughters princess themed party. Is there a printable for the tent cards used for the food/drinks? Hi Katelyn! Yes, I finally just added them. I included some pre-made options or a blank card for you to add your text. Thanks! Hello! 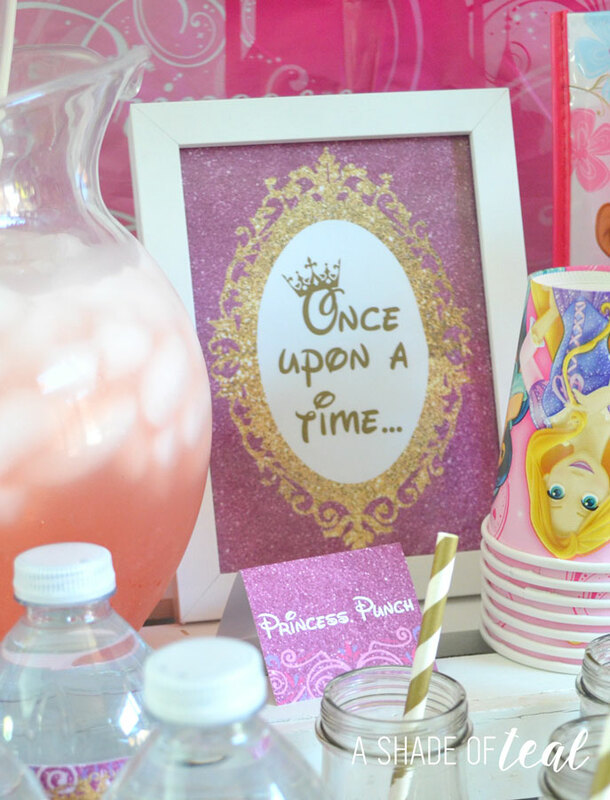 This is so awesome…absolutely using it for my daughter’s birthday in a few months. Just one question…to the right and left of the hydrangeas they look like bags. the one on the right has Rapunzel on it. Are they bags? If so, did you fill them with something? Thanks! Hi Barb! Yes they are bags I found at Walmart. For the pictures I just filled them with paper but for her actual party I used them as more goodie bags. 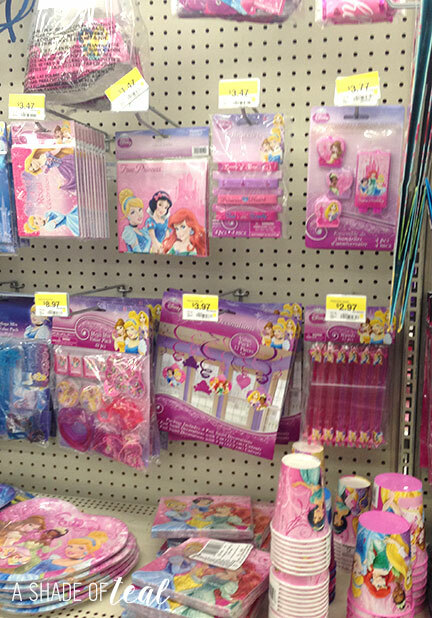 One more question…where did you get those larger sized princesses? Like the one on the top level of cupcakes? It looks like there is a Ariel, Cinderella, and Rapunzel one. Hi Barb, those were also purchased at Walmart. Sorry, not at this time. I’m working on creating a package for future sale on Etsy. Hi Miranda, So sorry but I’m no longer giving any more printable’s for free. I’ll be selling them all soon in my Etsy shop. how did you get the table cloth to drape like that with the gathers? 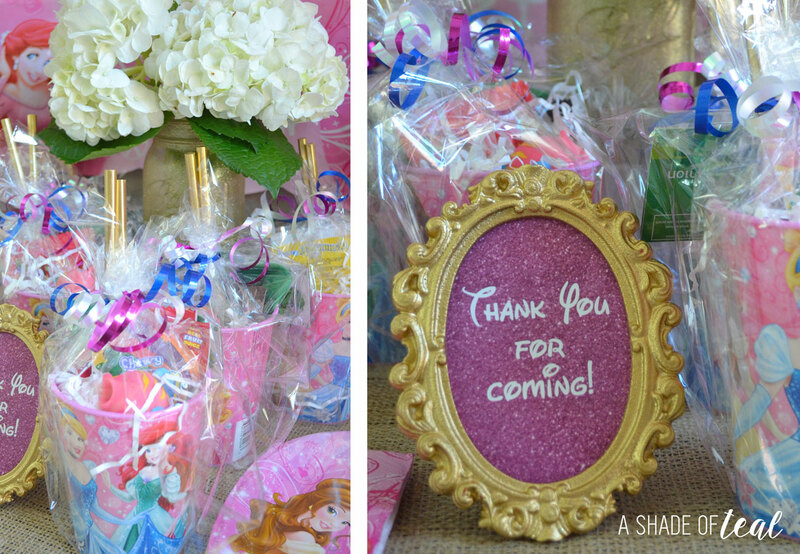 Thank you so much for sharing these printables and ideas! They are awesome!